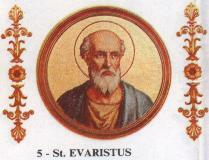 St. Evaristus succeeded St Clement in the See of Rome during the reign of Trajan and governed the Church for about eight years, as the fourth successor of St. Peter. The Liber Pontificalis says that he was the son of a Hellenic Jew of Bethlehem. In his first epistle addressed to the bishops of Africa, Evaristus decreed that seven deacons were to monitor a bishop’s preaching, to ensure that he did not lapse from the true teachings. — that he ordered seven deacons to monitor the preaching of bishops in order that orthodoxy be preserved. (1) The early Christian Church was rooted in Palestine, in the Holy Land; not only Jesus was born on Bethlehem, but also this Pope, the 5th in the line of Popes; the leadership of the early Church sprang from the land of Israel… even the leadership of the Church in Rome. (3) The concern for orthodoxy, for purity in doctrine as well as purity in life (for “orthodoxy” as well as “orthopraxis“) was not something that emerged much later, after Constantine. Nor did the inspiration to guard orthodoxy emerge with Catholic kings, as in Spain, or with the concomitant desire to impose a type of political unity through doctrinal unity. Determination to defend orthodoxy did not begin with the inquisition; nor after the Council of Trent, with the desire for doctrinal unity over against the defections from Catholic teaching preached by the Protestant Reformers. No, the concern for orthodoxy was very early, it was, as it were, woven into the “genetic code” of Christianity from the earliest years. Why was this so? Why did the early Christians wish to be sure that even their bishops be checked and admonished with regard to teaching the faith? Because the truth about the faith was important to early Christians, to men like Pope Evaristus. Truth was something to be vigilant about; truth was something that could be diluted, and lost; truth was also something that could be known, recognized, preserved, guarded, protected, as something precious, something to be cherished, something worth fighting to retain.